Tirpitz — German premium Tier VIII battleship. 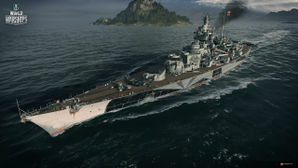 Tirpitz was first released for sale worldwide on 17 September 2015. Well-protected citadel and impressive durability. Tirpitz is among the hardest ships in the game to land citadel hits against; most AP shells will land normal penetrations and are thus easier to repair damage from. Weak deck armor makes Tirpitz susceptible to plunging fire at long range. Tirpitz has access to five Upgrade Slots as a Tier VIII ship. Tirpitz also has the option of building for Secondaries or for AA. A well-played Tirpitz is likely to find herself under intense enemy fire and captains will want to have access to Repair Party as quickly as possible; thus, Repair Party II ( ) is recommended for the quicker cooldown. The premium version of Damage Control Party ( ) is recommended for similar reasons. 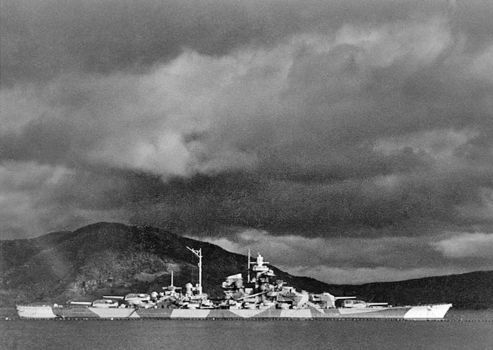 Tirpitz also has two alternate premium camouflages. The first, "Tarnanstrich", was earned through the Santa's Christmas Convoys event of December 2016 to January 2017; the other is called "Magnu-S", in which she appears as she does during the Halloween scenario "Sunray in the Darkness". Tirpitz steams ahead to avenge her fallen sister. Tirpitz has superb torpedo arcs. But be careful, as these torpedoes are easily damaged/destroyed. Tirpitz unleashes her torpedoes. Combined with excellent secondaries and great armor, she is a strong brawler. A scout fighter downs an enemy bomber. Tirpitz is hit by a bomb as she downs an enemy aircraft. An enemy torpedo bomber attempts to flee the area as a squadmate is destroyed. Its' home base aircraft carrier destroyed, one dive bomber makes a final attempt to destroy the Tirpitz... and fails.